I'm always struck by the love and affection people in this area have for Roan Mountain. I often hear people say that they're "going up to visit the Roan." As if they're setting out to see an old friend. And indeed they are. 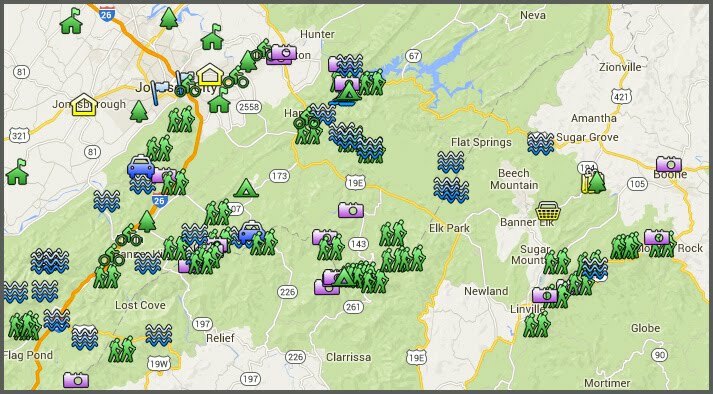 As I was setting up the map of all the area hikes and waterfalls I've discovered, I realized that the Roan was literally at the center of all of my Appalachian experiences. As you start up Round Bald from Carver's Gap, you encounter a dense conifer forest with an other-worldly quality to it. It's like a scene out of The Hobbit - there's something mystical about this short section of the Appalachian Trail. I've heard some people say they think it's spooky, as if a thousand eyes were secretly watching. I actually find it to be a very peaceful, serene place. Even if the winds are whipping on the balds above, the woods are usually calm and quiet. Often there's a mist that settles in, casting a soft glow over the landscape. Soon you emerge on the top of Round Bald - beautiful views in all directions. The top photo is of Round Bald as seen from near the top of Jane Bald which is the next bald you'll encounter on the AT. For those unfamiliar, the term 'bald' refers to a treeless area -- either a grassy mountaintop or a 'heath bald' covered with shrubs (usually rhododendron, mountain laurel, azaleas and blueberry bushes). Round bald is of the grassy variety; Jane Bald is in danger of becoming more of a heath bald. There's much debate as to how these mountaintops became 'bald' - it's not because of elevation (The only portion of the Appalachian Trail above the treeline is in the White Mountains of New Hampshire). Some blame severe forest fires, others say overgrazing of elk, bison and buffalo caused them. Whatever their origin, these wonderful balds provide stunning panoramic views! Recently, an effort has been made to retain the grassy character of 79 acres between Jane Bald and Grassy Ridge by introducing 34 blueberry bush-eating angora goats to the highlands (in fenced sections). The goal is to preserve what has been described as the longest stretch of grassy balds in the Southern Appalachians. My previous post here. Here's a video and article describing the project; and here's another video of them moving the goats to a new section of pasture. Soon after Jane Bald, the trail splits, with the AT continuing on to the left and a well-marked side trail heading up to Grassy Ridge to the right. 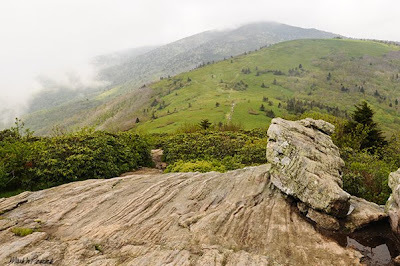 With an elevation of 6,189 feet, Grassy Ridge Bald is one of the highest balds in the Appalachian Mountains. The total distance of the hike from Carver's Gap to Grassy Ridge is 5.1 (roundtrip). To get different perspectives and see additional photos of this beautiful hike from others click here and here. Directions: Take Route 19E to the town of Roan Mountain, turn onto Route 143 and travel 12.8 miles to the TN/NC state line (Carver's Gap). 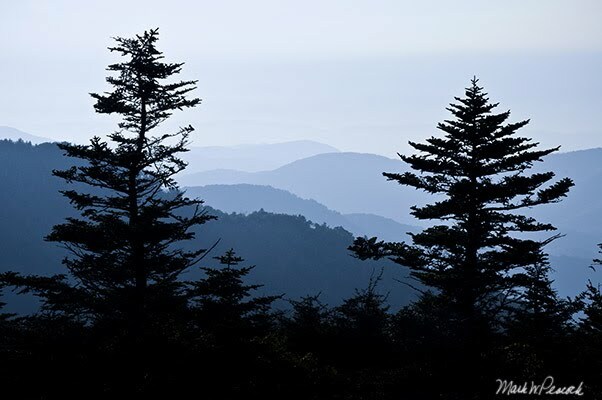 On your way up the mountain, you'll pass through the Roan Mountain State Park. Eventually, you leave the state park and enter the national forest. Park at Carver's Gap, cross the road to your left, and you'll begin your ascent to the Balds on the Appalachian Trail. For more things to see and do on Roan Mountain, click here. For a google map of the area, click here. I love the little hike from Carver's Gap up to Round Bald. I, too, thought of a mystical land when I walked through the forest. I thought more of Lady Galadriel watching me than I did a hobbit town, but I think adventurous hobbits would have made the journey with me if promised some good eats at the end. On Sunday, I am on my way up to that area, and my feet will be walking those wonderful trails again. I can't wait. Sounds wonderful! Is this a hike that two novice hikers could make? If not, are guides for hire and if so, where would we find one? Absolutely! No guides needed. This is a popular hike and an easy one. Hiking boots are helpful on the moderately steep section leading up Jane Bald. Maybe a hiking stick, too. But take your time, watch your step and enjoy the views! Approx how long (miles) is this hike...is any time of the year better than others?? A little over 5 miles roundtrip. It's a gorgeous hike anytime of year, but June is the best time with the rhododendrons and azaleas blooming. Yep. Just be sure to keep them on leash! Definitely going to check the Roan Balds out soon.. I was wondering, if it is a good idea to take a look at the Douglas Falls Trail? 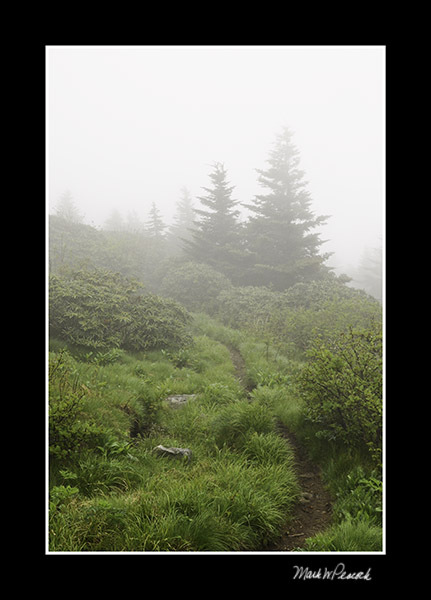 It is a nice 7.2 mile out-and-back trail from the Coleman Boundary area of the Pisgah National Forest up to Craggy Gardens. This hike sounds great! What's the wildlife like? Any especially good places to stop for lunch? When is the best time to go for fall photography? Depends on the year. I've found the Balds aren't always the best destination for fall shots, given that they are balds and that pines and spruces seem to dominate Roan. I'd recommend heading over to the Blue Ridge Parkway in mid-October. Rough Ridge is my favorite. Price Lake and Bass Lake are great. Weekdays are best. I watch Instagram to see where the leaves are for a given destination. My husband and I planned to hike up here this weekend, but it's supposed to be pretty cold, and will obviously be even colder there.. Do you know if the roads are open up there this time of year? The road up to Carver's Gap is open all winter -- but can become difficult/dangerous during times of heavy snow. While we may only receive a dusting in the lower elevations, the higher elevations could get several inches -- so be sure to watch the local weather forcast. The road leading from Carvers Gap to the old Cloudland site is gated all winter. Not sure when it reopens, but it will be later in the spring. But you can park at Carvers and then take the AT up to the balds or up Roan Mtn to Cloundland. Stay warm! Are there any spots to put up a hammock to spend the night? My husband is wanting to go camping and hiking this weekend, and I've always wanted to hike this area. Is this a good spot to camp? If not, where would you recommend? I would imagine there could be a spot in the spruce forest you encounter on your way up to the balds. The bald of course are known for not having trees, although there are a few pines at the top -- but my memory is that they are pretty 'full' in terms of branches. On the other side of Carver's Gap, on up to the Cloudland site, you'll find endless opportunities...lots of trees near the Roan High Knob. :) If you have a tent, there is a spot on Round Bald people camp behind a row of pine trees. Maybe others who have camped there will chime in...Sorry if I'm not much help, I'm more of a day hiker! :) Happy trails! Great hike! I just hiked from Carvers Gap to 19E (Mountain Harbour B&B/hostel) for the second time. Strongly recommend paying the $5/night parking at Mountain harbour B&B - It's safe and the people who run it are incredibly nice, oh and it has shuttle service. Can you ride your horse up?